All our appreciation goes to June's DR K-12 PI Meeting participants. In this issue, we highlight some of the information, ideas, and resources that came out of your good work and conversation at the event. I am also excited to share that I have very confidently transferred the CADRE PI role to Catherine McCulloch, the past CADRE Co-PI and Project Director. Catherine has the experience and strength that will be essential to lead this network into the next phase. I have enjoyed developing the CADRE structure and agenda along with many of you, and it has been exciting to be a "small part" of the growth of the DRK-12 portfolio and the research and development community. To the CAREER awardees and CADRE Fellows, we were delighted to have your active engagement at the PI meeting and hope that both the substance and networking opportunities were helpful. To those who developed videos for the NSF Showcase, they are now on our website. If you did not have a chance to view these videos, we encourage you to tune in! The newsbites section of this newsletter continues the knowledge sharing begun at the meeting. This is a good dissemination opportunity as the newsletter reaches an estimated 3,800 education researchers, developers, practitioners, and policy-makers. With each newsletter, the number increases. Greetings from Catherine: Thank you, Barbara, for your vision and hard work to advance DR K-12 research. The CADRE team is looking forward to a busy fall, and connecting with each of you as we continue this work. Some of our activities will include: hosting DR K-12 Solicitation and Nuts & Bolts webinars, welcoming new PIs, and producing resources to support early career researchers and developers. We will also continue to spotlight DR K-12 projects and your work on the CADRE website and through social media. To that end, we are producing a video blog that highlights contributions of DR K-12 projects in different areas of STEM education I welcome each of you to contact me with your ideas and suggestions for promoting our collective learnings. I'd also like to thank our PI meeting advisors for their invaluable contributions during the planning process: Jodi Asbell-Clarke, Amy Brodesky, Doug Clark, Tutita Casa, Dan Damelin, Jim Diamond, Cathy Kinzer, Magaly Lavadenz, Emily Moore, and Amy Parks. Congratulations and welcome to all recently announced DR K-12 awardees! We enjoyed meeting many of you at the PI meeting and look forward to getting to know all of you better as your work continues. We will share an updated list including subsequent awardees in our Fall 2016 Newsletter. Joan Ferrini-Mundy welcomed participants and kicked off the meeting with an overview of the state of DR K-12, including challenges, opportunities, and the program's place in NSF's larger strategic initiatives. *The Ideas for Future Investment described in this session are further explained in this document retrieved from the NSF Toolkit on nsf.gov. James Paul Gee offered a theory of STEM learning based on embodied cognition; discussed new forms of teaching and learning outside of school; and considered the wider framework within which STEM should sit in our world. Jodi Asbell-Clarke responds by suggesting key takeaways for DR K-12 researchers and STEM educators. Perspectives from the Field: What Research Do We Need? Nancy Shapiro, Linda Chen, and Jack Smithinvited participants to look into the future and consider a research agenda for STEM education that responds to the needs of schools, districts, and states. In a response, Shapiro reflects on the discussion and its implications for the NSF and DR K-12 communities. In addition to the plenary sessions, more than 80 awardees and invited speakers led 31 panels, "short talks," and structured poster sessions targeting crosscutting questions, ideas, and challenges. Descriptions, slides, posters, and related resources are available for most concurrent sessions through the online agenda, where you can browse the full agenda, by STEM area, or by theme. More than 120 projects shared their work at the PI meeting's general poster sessions, and 32 participated in the CADRE's third, and largest, Digital Learning Arcade. We've made their posters available in virtual poster halls on the CADRE website. CADRE continued its ongoing focus on supporting the emerging leaders in STEM education research and development with special PI meeting programming for the CADRE Fellows and NSF CAREER awardees. In April, PIs Maria Blanton and Stamatis Vokos joined the Fellows to share their experiences and insights in a webinar discussion on proposal writing. 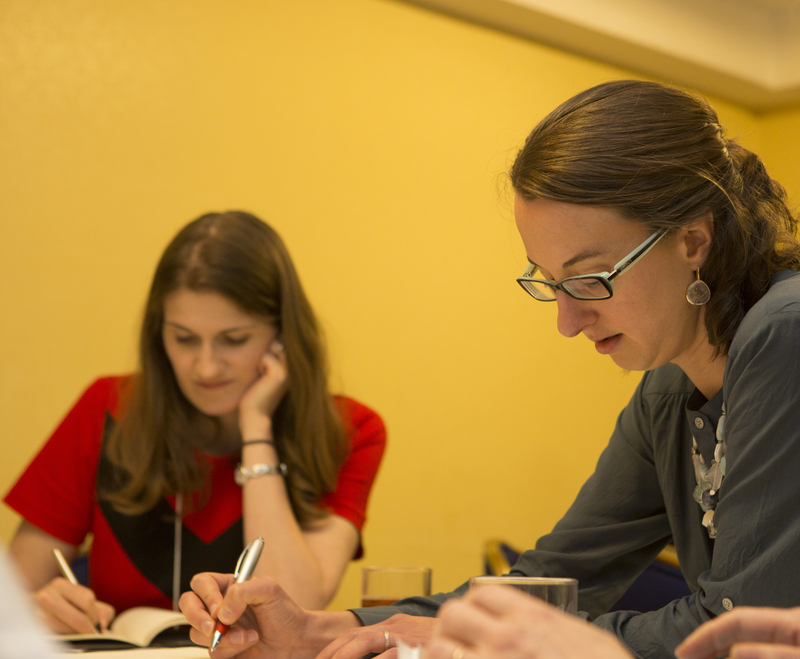 Building on this experience, Fellows met in Washington, D.C. to participate in a mock proposal review with NSF's David Campbell. 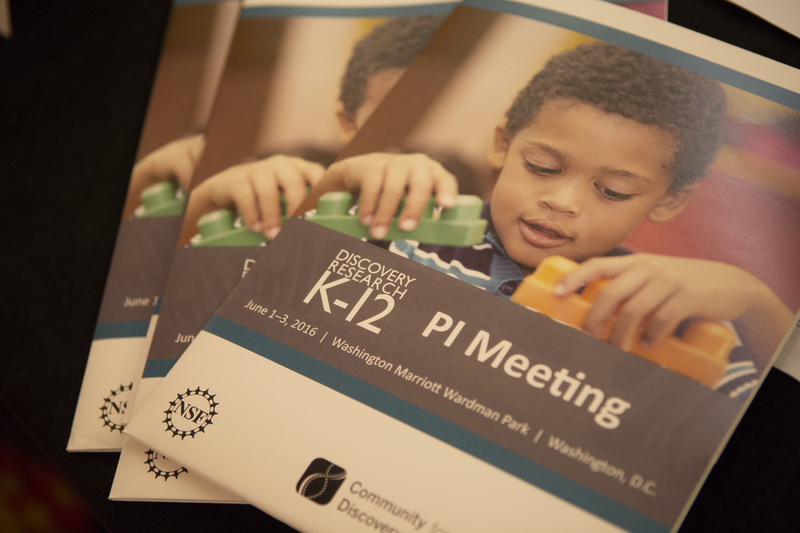 They then connected with the broader DR K-12 community through their participation at the PI meeting, bringing the seventh year of the fellowship to a close. Thank you to the many awardees who have supported our Fellows in diverse ways! Surveys administered throughout the Fellowship indicate that we made great strides in accomplishing our goals of supporting Fellows' professional needs while simultaneously facilitating relationships with other Fellows, alumni, and PIs. Overall, Fellows were highly satisfied with the Fellowship and experienced many benefits. They appreciated the events and activities, and especially valued the in-person meetings and the networking opportunities they provided. Most Fellows indicated they had established personal and/or professional relationships outside the parameters of the Fellows program, and planned to connect with Fellows in the future for professional advice and networking. They believed the Fellowship offered them important insights into the world of STEM Education R&D. Awardees of the NSF CAREER Program gathered to discuss issues related to managing an NSF grant. Conversations centered on themes such as project management, making best use of advisors and evaluators, building and nurturing partnerships, interacting with NSF, and disseminating project work. Awardees identified resources and supports that would be useful for the broader early career community. 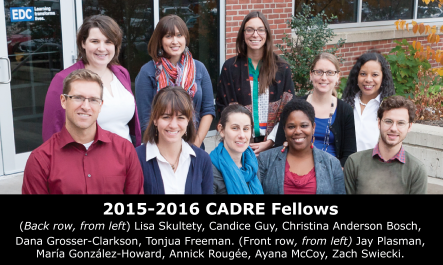 CADRE will continue to work with CAREER awardees to help build some of the supports they identified. The PI meeting featured sessions that addressed this year's theme of Making an Impact in a variety of ways. Effective dissemination was the focus of several activities at and leading up to the PI meeting, where special attention was given to strategies that help target a range of audiences -- such as using video. Two PI meeting sessions focused on video as a tool for dissemination. 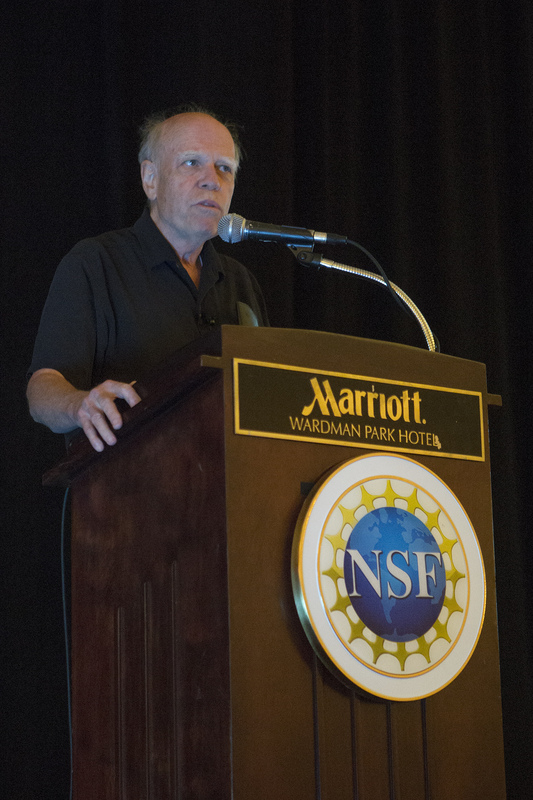 Jim Galdos provided practical tips for planning and producing videos that effectively convey project work, and members of the OSPrI project considered the role of video in drawing broader audiences to NSF research. Just prior to the PI meeting, 156 projects, including 36 from DR K-12, participated in the 2016 NSF Video Showcase by contributing videos that communicate the nature and promise of their work. During this virtual event, presenters and showcase visitors engaged in discussion around the work that was shared in the more than 2,771 discussion posts added to the site. The showcase has received more than 30,000 visitors from 160 countries. Coming soon! At the PI meeting, CADRE sat down with several PIs to discuss key ideas, challenges, and opportunities related to the topics of engineering, learning technologies, mentoring, modeling, professional development, as well as the collective impacts of DR K-12 work. Stay tuned for a video series featuring these interviews and highlighting these important areas of work in the DR K-12 portfolio. Thank you to Jodi Asbell-Clarke, Doug Clark, Dan Damelin, Christine Cunningham, Cory Forbes, Aaron Johnson, Vikram Kapila, Susan Kowalski, June Mark, Kathy Perkins, Arthur Powell, Brian Reiser, Chris Rogers, Megan Wongkamalasai for their time and contributions in D.C.
We're pleased to share this quarter's news from DR K-12 projects and people, as well as our sister resource networks who serve other NSF funding programs (ARC, CAISE, CIRCL, MSPnet, and STELAR). In addition to our newsletter digest, we disseminate your news items on our website and social media. Let us hear from you! In the Press | Todd Campbell and Drew Neilson share strategies for engaging students in using models. 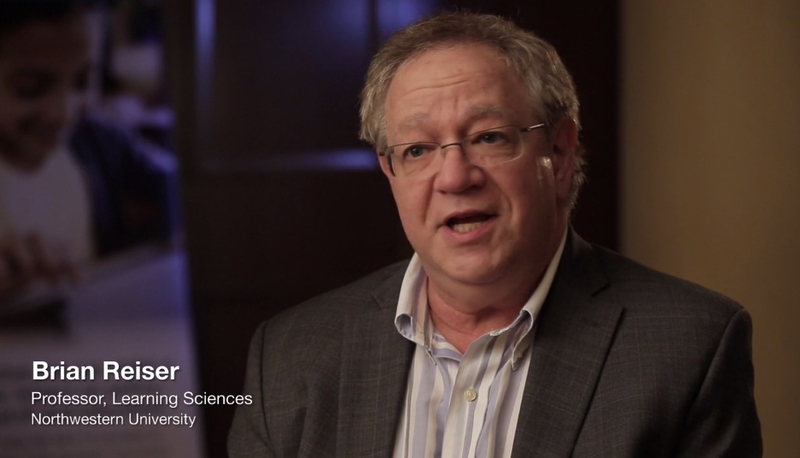 How Did Science Teachers Address Ebola? And How Will They Respond to Zika? In the Press | Edweek highlights the work of Stopping an Epidemic of Misinformation: Leveraging the K-12 Science Education System to Respond to Ebola and their recent report on educators' responses to the recent Ebola outbreak. In the Press | Learnography's Kate Salmon sat down with Kathy Perkins at SXSWedu to talk about the PhET project and her work with simulations in education. In the Press | Scratch and ScratchJr made Mind/Shift's list of 30 ed-tech apps recommended by librarians. In the Press | Erin Furtak shares how she keeps her writing efforts organized and productive as an associate professor. In the Press | In this Mind/Shift article, PI Heather Hill shares her perspective on supporting creativity in the math classroom. Publication | Christopher Harris, Joseph Krajcik, James Pellegrino, and Kevin McElhaney describe how they use principles of evidence-centered design to develop classroom-based science assessments that integrate three dimensions of science proficiency. Publication | Lama Jabera and David Hammer argue for cultivating students' feelings and motivations within the science discipline. Publication | In recent publications, Math Snacks 1) reviews methodologies used to determine the effectiveness of games and animations for learning; and 2) shares findings from a study measuring the effect of four games on students' understandings of ratios, coordinate plane, and number. In a related TEDx Talk, PI Karin Wiburg suggests a radical redesign of teaching and organizing mathematics curriculum. Publication | Erin Furtak, Howard Glasser, and Zora Wolfe describe a process for designing formative assessments and using a variety of data to improve science teaching. Publication | A number of DR K-12 awardees contributed to this book (as editors and authors), which examines exemplary models of online and blended teacher professional development. Publication | Julianne Wenner and Todd Campbell compiled a literature review about what it means to be a teacher leader. Report | A recent report from Massachusetts Engineering Innovation and Dissemination Community (MEIDC) provides a landscape analysis of K-12 engineering education in the Greater Boston region. Catherine McCulloch reflects on highlights from the report in her blog post: Elevating and Enhancing the "E" in STEM Education. Report | Michael Steele, Janine Remillard, John Baker, Lindsay Keazer, and Beth Herbel-Eisenmann share findings from an NSF-funded study on the policies, practices, and perceptions related to Algebra I in school districts across the U.S.
Website | The Online Resources for Educating Students about Ebola and Other Emerging and Re-emerging Infectious Diseases project has launched infectionsdiseases.edc.org, with modules and resources to support exploration and understanding of infectious disease epidemics. Email cadre@edc.org to share news from your project. The NSF Cyberlearning conference took place June 3-5 in Washington, D.C. Webcast recordings of keynotes and special speakers; a Storify review of the event in tweets; and a blog post reflecting on the event are all available on circlcenter.org. The STELAR website offers a collection of resources related to the ITEST program and solicitation, preparing your proposal, developing a robust research design, creating an effective evaluation strategy, connecting with partners, reaching underserved populations, and developing the workforce of the future. In his latest blog post, Brian Drayton reflects on the life of Jerome Bruner and his contributions the "cognitive revolution." New Informal Science Articles from CAISE "Edit-aThon"
Following the Research Meeting on Making and Learning, CAISE held a one day working meeting to create new content for the informalscience.org Knowledge Base. The meeting generated 10 new articles on topics including assessment in informal science, facilitating makerspaces, equity in making, and design-based research. In November 2015, STELAR, CIRCL, and CADRE worked together to organize an NSF-funded STEM Forum on Next Generation STEM Learning for All, which engaged a range of stakeholders in examining challenges and successes in STEM education. This report presents important takeaways from the Forum. The following funding, publication, and career opportunities, listed by deadline, may be of interest to you or your DR K-12 colleagues. For other opportunities, see CADRE's List of STEM Education Publications (PDF). If you are PI or Co-PI on a DR K-12 grant, we encourage you to share this newsletter with your colleagues. Many of our news items, resources, and events may be of special interest to others on your project team, e.g., early career researchers and developers, evaluators, communication specialists, etc. We welcome all as part of our DR K-12 community and invite them to subscribe to this newsletter, join us on social media, and create an account on the CADRE website. Let us know how we can improve our communications by completing a short survey.